Gerardo Martino enjoyed his competitive debut with Barcelona more than Carlos Ancelotti's with Real Madrid as the La Liga champions stormed to a 7-0 rout of Levante in their season opener at the Nou Camp on Sunday. Elsewhere, Brazilian striker Diego Costa scored twice as Atletico Madrid beat Sevilla 3-1 away, and Granada were 2-1 winners at Osasuna. At the Nou Camp, World Player of the Year Lionel Messi and Spain striker Pedro both scored twice, while new 57 million euro signing Neymar started on the bench and came on as a 63rd-minute substitute with the game already resolved. Barca made a whirlwind start, scoring six times before halftime as the team responded to Argentine Martino's calls for greater intensity in their pressing game and a more direct approach. "The debut exceeded all my expectations," Martino told a news conference as he insisted he had not made any changes to the way the team played. 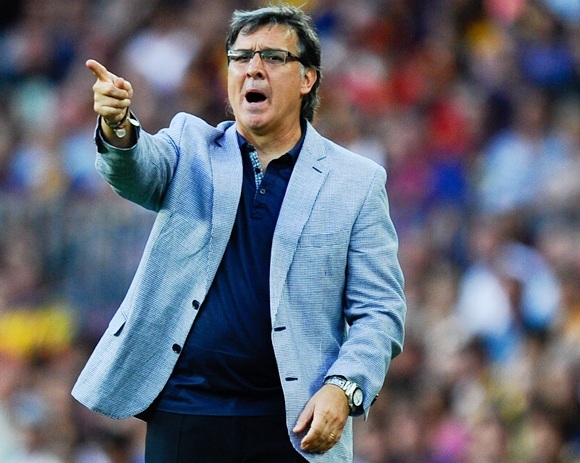 "I am not looking for a Barca modeled by Martino. I was already a fan of Barca's concepts of play before I came, and all I want them to do is to do some things they have forgotten or stopped doing. "We put them under pressure well and kept it going for a long time." The outstanding Cesc Fabregas squared for Alexis Sanchez to tap in the opener in the third minute, and Messi exchanged passes with Pedro to stroke in the second. Dani Alves struck the third after another slick passing move on the edge of the area, and Pedro, who started wide on the left of the attack keeping Neymar on the bench, bagged the fourth. Adriano was felled for a penalty in the 42nd which Messi fired home, and Fabregas set up Xavi with an extravagant looping pass over the defence for the sixth, just before the break. A limp display from the cash-strapped visitors, under new coach Joaquin Caparros, could only look to a string of saves from goalkeeper Keylor Navas as any sort of positive. Brazil forward Neymar was given a rousing reception when he came on for his competitive debut and showed a few nice touches but it was Pedro who notched the seventh after a mix up in the Levante defence in the 73rd. While Real pursue Tottenham Hotspur winger Gareth Bale for a reported world record 100 million euros, it was a player who cost Betis one euro and 20 cents, Cedrick Mabwati, who set up the opener at the Bernabeu. The Congolese winger surged forward and crossed low for Molina to divert the ball past Diego Lopez, preferred in the Real goal ahead of Iker Casillas. Betis were audacious in their approach and Joan Verdu should have doubled the lead when he fired wide as the hosts looked disjointed. Real had already had two goals ruled out for offside when new signing Isco fed Benzema, and the France striker scored at the near post. Betis's Nosa slammed a header against the crossbar from a corner and Cedrick had a good shot for a penalty waved away, but Real responded in the second half, Cristiano Ronaldo rattling the crossbar straight after the re-start. The Portugal forward, Angel Di Maria, Benzema and Marcelo all had further chances as the pressure grew, and with time running out Marcelo crossed and Isco headed just under the crossbar. "We can do better," Ancelotti told a news conference.